The Post office, bank, bars, restaurants shopping centre and market are just 3-5 min walk away from Rooms Gara. The Old Town is a 20min walk and bus runs every 5 min to Old Town. We are open all year round if you are looking for a quiet place to rest and relax! The Rooms Gara does not feature a kitchen, but we do offer tea, coffee and fruit to guests throughout their stay. Breakfast cost 4 euro extra. Probably our favourite hostel ever! The owner and her family were brilliant and made us feel so at home. I was quite ill one day and she really went the extra mile to make sure I was okay. She also cooked us a meal one evening which was lovely. Room was great, location not a problem, actually very useful with the bus station, and we got all the information we needed! Wouldn’t change anything about this hostel. We hope to come back soon! Louis & Lily. Perfect location straight opposite the main bus station. Cheap to get into the old town by bus. The room was prefect for me and my friend for the weekend who had been travelling around croatia. The host was the nicest person we met in dubrovnik she couldn't do enough for you, really nice woman! I would recommend staying here you'll get good value for money and you'll be well looked after. We have just finished our stay at Rooms Gara,the owner was incredibly helpful on arrival offering suggestions on what to do and even cooking a lovely homemade meal. She was very welcoming throughout answering any questions we had at any point and always ensuring that we were happy guests. The facilities were everything you could ask for. Whilst it is a bit of a way out of the center it is easily walkable and there are regular buses going from just outside the rooms. Highly recommend. Very nice host. Apartment is clean, location is excellent, host is helpful. 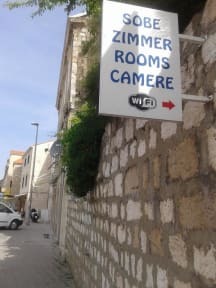 Initially was thinking that guesthouse is just 10 minutes walk from city center of Dubrovnik but in the end it turned out to be 10 minutes by bus and 40 minutes by walk. Anyway, just 1 minute from bus station, rooms with good air-conditions, shop around the corner. Perfect accomodation when you need some quiet away from the people and crowds! Very cosy. The host was lovely and very welcoming. Directly across from a bus stop that the bus’s from everywhere else drop you off at which was awesome, especially since the hostel is across from a bus stop that takes you into town. The owner is nice, does meals for you if you pay. Due to how expensive it is we will go elsewhere to save money for sure, the rooms are quiet small aswell.